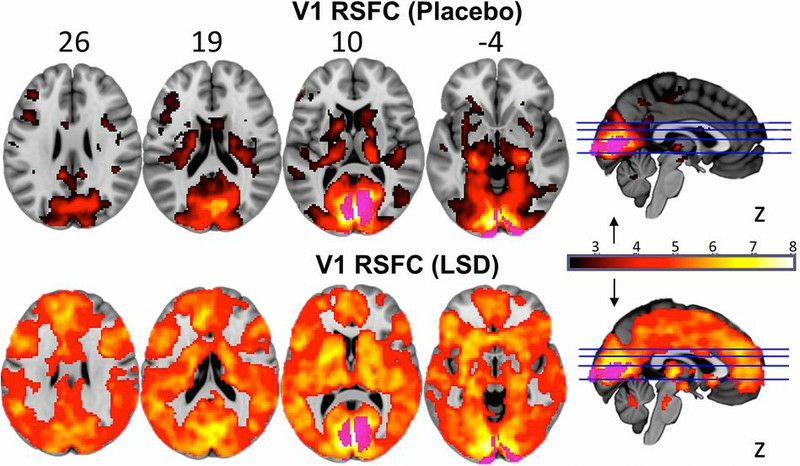 The image comes from a new study published in the journal PNAS, which used modern techniques to map out the effects of a placebo and LSD on 20 healthy participants' brains. The results show clear differences, with the images of the brain on LSD showing muchmore connectivity between different sections of the mind. This can help explain visual hallucinations, because it means various parts of the brain — not just the visual cortex at the back of the mind — are communicating during an LSD trip. "Normally our brain consists of independent networks that perform separate specialized functions, such as vision, movement, and hearing — as well as more complex things like attention," study co-author Robin Carhart-Harris said in a statement. "However, under LSD the separateness of these networks breaks down and instead you see a more integrated or unified brain." The researchers hope these kinds of images, which will likely be expanded on in future studies, can help us learn more about LSD and other psychedelics. This is especially relevant as a growing body of research, pushed by groups like the Multidisciplinary Association for Psychedelic Studies, uncovers the potential therapeutic and medical benefits to psychedelic drugs. "In many psychiatric disorders, the brain may be viewed as having become entrenched in pathology, such that core behaviors become automated and rigid," the researchers wrote. "Consistent with their 'entropic' effect on cortical activity, psychedelics may work to break down such disorders by dismantling the patterns of activity on which they rest." The new brain imaging study, for instance, found a connection between some of the changes in brain activity and what's known as "ego death": a phenomenon in which people lose their sense of self-identity and, as a result, are able to detach themselves from worldly concerns like a fear of death, addiction, and anxiety over temporary — perhaps exaggerated — life events. The research increasingly suggests this could help people not just with medical issues but with more typical everyday problems as well. 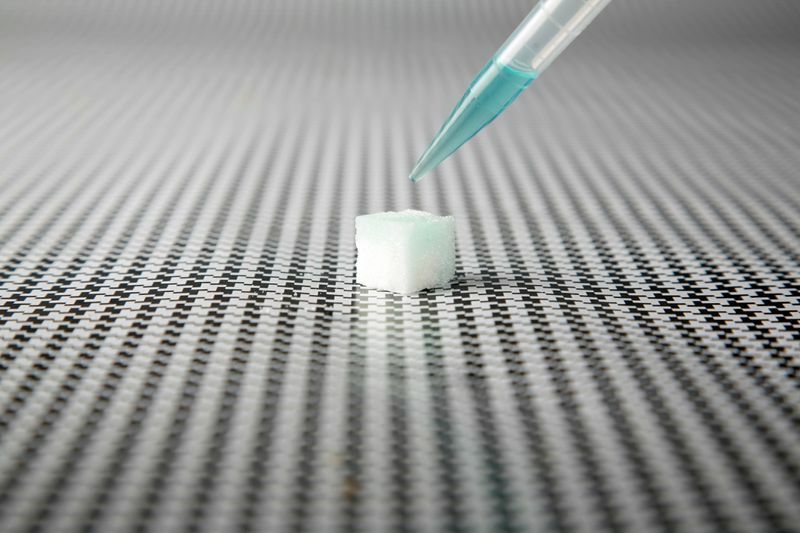 Dropping LSD onto a sugar cube. When people take a potent dose of a psychedelic, they can experience spiritual, hallucinogenic trips that can make them feel like they're transcending their own bodies and even time and space. This, in turn, gives people a lot of perspective — if they can see themselves as a small part of a much broader universe, it's a lot easier for them to discard personal, perhaps insignificant and inconsequential concerns about their own lives and death. That may sound like pseudoscience. And the research on hallucinogens is so early that scientists don't fully grasp how it works. But it's a concept that's been found in some medical trials, and something that many people who've tried hallucinogens can vouch for experiencing. It's one of the reasons why preliminary, small studies and research from the 1950s and '60s found hallucinogens can treat — and maybe cure — addiction, anxiety, and obsessive-compulsive disorder. Charles Grob, a UCLA professor of psychiatry and pediatrics who studies psychedelics, conducted a study that gave psilocybin to late-stage cancer patients. "The reports I got back from the subjects, from their partners, from their families were very positive — that the experience was of great value, and it helped them regain a sense of purpose, a sense of meaning to their life," he told me in 2014. "The quality of their lives notably improved." Death looms large in the journeys taken by the cancer patients. A woman I'll call Deborah Ames, a breast-cancer survivor in her sixties (she asked not to be identified), described zipping through space as if in a video game until she arrived at the wall of a crematorium and realized, with a fright, "I've died and now I'm going to be cremated. The next thing I know, I'm below the ground in this gorgeous forest, deep woods, loamy and brown. There are roots all around me and I'm seeing the trees growing, and I'm part of them. It didn't feel sad or happy, just natural, contented, peaceful. I wasn't gone. I was part of the earth." Several patients described edging up to the precipice of death and looking over to the other side. Tammy Burgess, given a diagnosis of ovarian cancer at fifty-five, found herself gazing across "the great plain of consciousness. It was very serene and beautiful. I felt alone but I could reach out and touch anyone I'd ever known. When my time came, that's where my life would go once it left me and that was O.K." But Mark Kleiman, a drug policy expert at New York University's Marron Institute, notedthat these benefits don't apply only to terminally ill patients. The studies conducted so far have found benefits that apply to anyone: a reduced fear of death, greater psychological openness, and increased life satisfaction. "It's not required to have a disease to be afraid of dying," Kleiman previously said. "But it's probably an undesirable condition if you have the alternative available. And there's now some evidence that these experiences can make the person less afraid to die." He added, "The obvious application is people who are currently dying with a terminal diagnosis. But being born is a terminal diagnosis. And people's lives might be better if they live out of the shadow of the valley of death." "BEING BORN IS A TERMINAL DIAGNOSIS. AND PEOPLE'S LIVES MIGHT BE BETTER IF THEY LIVE OUT OF THE SHADOW OF THE VALLEY OF DEATH." Again, the current research on all of this is early, with much of the science still relying on studies from the '50s and '60s. But the most recent findings are promising enough that experts like Kleiman are cautiously considering how to build a model that would let people take these potentially beneficial drugs legally — while also acknowledging that psychedelics do pose some big risks. For example, psychedelics like LSD could be administered in a controlled setting where trained supervisors watch over users as they go through a trip. This is how many of the medical trials have worked so far: A supervisor, such as a trained doctor, watches a user and makes sure the participant doesn't get into trouble — like jumping out a window or having a panic attack — and guides the trip so it's as productive as possible, focused particularly on how to overcome anxiety and other mental anguish. Such a model, experts say, could maximize the potential benefits of a good trip while avoiding the risks of psychedelics — mainly, dangerous accidents or a bad experience that can cause psychological trauma. The research on all of this, again, is early. But by seeing the potential benefits of these drugs in trials and mapping out how, exactly, psychedelics affect the brain, doctors are getting much closer to potentially uncovering a very potent treatment for anxiety and other grave mental illnesses.